Surely one of these standing passengers gave up a seat for an elderly or disabled person. It's New York, after all. 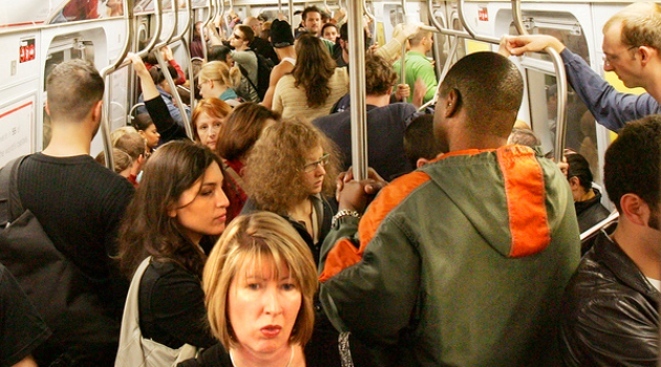 Rudeness could earn New York City transit passengers a ride to jail. A new campaign reminds subway and bus riders to give up reserved seats to the elderly or disabled. Those who refuse could be fined $25 to $50, or even face up to 10 days in jail. Signs are going up this week in thousands of subway cars and buses. The law has long been on the books; transit officials are now trying to get people to obey it. Evelyn Quinones, of the Bronx, who uses a walker, says people used to have better manners. "The world has changed," the 77-year-old woman said. Jamie Schuh, 26, told the New York Post that it shouldn't take a law or a sign to prompt someone out of his seat. "They should do it out of common courtesy," Schuh said. But Teddy Richardson, 27, shared a different take. "It should be up to you whether you give up your seat or not," he told the paper. "It's take it as you get it, grab it as you see it."